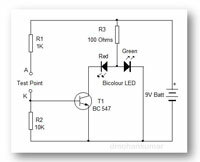 Title of the circuit is deliberately given because it is used for testing the Photo diodes, Infrared LEDs, Photo transistors etc working in “Silent Mode”. How can we confirm an Infrared LED is working or not. It gives No visible indication. It is working and emitting Infrared rays but the IR rays are beyond our spectral response and we can’t see it. So this simple tester will help you to check whether such devices are good or bad before using in a circuit or even during trouble shooting. Not only one function the tester doing . It can test, all diodes, Capacitors, LEDs etc. Its cost is just Rs.10 but it is a worth tool.